Eighteen years ago Peter developed a pain in his left hip. Peter did what I used to do whenever I went into labour: ignore it for as long as possible and hopefully it goes away. I suppose this is called denial, but the thing with pain is that you can ignore it only for so long before it catches up with you. At least with childbirth you know that each contraction brings you closer to that magical moment where you finally get to hold your newborn baby in your arms. In Peter’s case there was no such luck and after 6 months of pain he had to admit that it was time for the baby to come out, which meant in his case to get a medical diagnosis. The surgeon told Peter that from now on the pain would only get worse as any movement would wear away the bone structure even further and that a hip replacement was inevitable. Pete was advised to stick it out for as long as possible because he was only 42 and new hips don’t last forever. How we discovered the Robertson Technique worked! Just a few months earlier I had studied structural alignment through the release of energy blockages. If these energy blockages are held in the body they can cause postural misalignment, imbalances in the biochemistry and negative changes in behaviour. When these blocks are cleared, pain and stiffness often disappear miraculously to be replaced by a feeling of general wellness and improved flexibility. During the day I worked as a sole therapist in our newly opened clinic behind our house in Forth. Peter was working full time as a nurse and part time in our clinic when his hip started to play up. We were so busy that I hardly took any notice of Peter’s posture or pain till the day Peter came home with the news that his pain was caused by a congenital hip deformity and that he needed a hip replacement. The moment Pete came home and told me the bleak prognosis is forever engraved in my memory: the children were running around, there was washing to fold and schoolbags to unpack, the fire had to be lit and dinner was cooking on the stove. All sorts of questions tumbled around in my head: How was Peter going to keep up doing two jobs with a hip deformity? We didn’t have private health insurance and the waiting lists were huge. But how much longer was he able to continue in daily pain? How was I going to put up with a husband that suffered all the time and be happy for my kids and clients? Would I be able to manage to pay the bills on my own for a while? Suddenly it all seemed very overwhelming. We had dinner and did the dishes when I was struck by a flash of inspiration: I could give Peter a structural alignment session! Reading my life backwards it seems crystal clear now that I should have looked at that option first and not last, but in those days life was so demanding that we sometimes our vision was a bit blurred. Peter changed into comfy clothes and obediently followed me to the clinic, where he lowered himself onto the massage bed in my room. The children had followed me as well and some were squabbling under the table while the older ones were upstairs in their bedrooms. I decided to completely ignore the kids and give Peter’s body my 100% attention. When it was time to get up Peter tested his hips and his back and there was no pain. He stretched, bent over, walked around and not only did he discover his chronic pain had gone, he also found that he could suddenly open his hips up and stretch out his legs further than he had been able to his entire life. It felt too good to be true but as the days stretched into weeks and then years, Peter kept on feeling fine, flexible, energetic and free of pain. We had to admit that our therapies not only worked, the effects were lasting. Hip pain dissolved, a miracle! It convinced us that when we work with our body rather than against it miracles can and do happen. Peter has never had that pain again even though his bone structure hasn’t changed and he still had a congenital hip deformity. He has renovated numerous buildings and landscaped gardens, as well as worked full time at the Purple House. He is as fit now as he was 30 years ago and there has never been any more talk about a hip replacement. From that moment on we included this technique in our massages and trained our practitioners at the Purple House to do the same. When I gave Peter his first hip release treatment we expected a little bit of relief but nothing as dramatic as a complete ‘cure’ for his pain and stiffness. Now we know better because we have seen this miracle repeat itself over and over. The pelvis / hips / ileosacral joint seems to be the body’s secret rubbish tip for unresolved negative emotions. This creates a minefield of problems, the most obvious one that our ‘hips are out of whack’ and one leg ends up shorter than the other. This is usually remedied in one session. The psoas can have a very direct effect on the neck muscles and the nerves that are situated there. If this is the case, it will make no difference what you do to your neck, the psoas will just pull it back out. When the pelvis is tilted this can in some cases contribute to nausea and vertigo and realigning the pelvis works a treat. The trick is that we do the limb movement with very slow and steady pressure, all the while waiting for the muscles and tissues to relax and release blocked energy. The blocked energy is often released layer by layer, from the abdominal wall to deep into the psoas and pelvic structure. This allows the body to let go at its own safe pace. 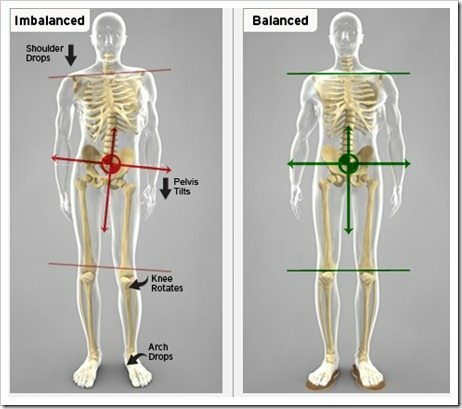 Our method is unique in that it combines postural alignment with very specific energy holding points on the body and it should be done completely pain free. With this technique NO PAIN means MORE GAIN and not the other way around. Because the body ends up doing the corrections itself it means that the positive results are lasting, like Peter who never looked back after his treatment. We do recommend that the client has at least three consecutive sessions because it often takes the body three goes before the message has become hardwired into the computer. While I never believe that there is ONE therapy that is THE ANSWER to absolutely EVERYTHING, I do think that our structural alignment work using energy release helps your entire system and is as good a miracle therapy as any. We have had many clients who were scheduled for surgery or who were told they had to stay on painkillers / anti inflammatory drugs forever, or needed ‘adjustments’ for the rest of their lives, who were able to cancel everything after working with us. This is a gentle, non-invasive method of healing. While the workings of it may seem somewhat mysterious, the effects are immediately measurable. The spine is straighter, the legs are now of an even length, the arms and legs can move freely, and the pelvis is able to open further. (This creates a more relaxed outlook on life!) Pain is reduced or completely gone. Whether your problems are genetic or whether your pain is from a terrible shock, accident or emotional trauma, the pain that has settled in your body can be ‘extracted’ and released. With every layer of emotional debris that bites the dust we not only heal ourselves, the healing effects also flow out towards our loved ones, our ancestors and our offspring. We heal backwards, forwards and sideways and it is our responsibility to never give up! This structural alignment session (or ROBERTSON technique) on its own can take anything from 30 minutes ($95) to an hour ($145) and you can wear comfortable clothing. We often combine it with a back massage and/or reflexology / kinergetics which makes it even more enjoyable. For this you need to allow an hour. This therapy comes under the umbrella Combination Consult – Combination consultations can incorporate one, two or as many different modalities as you and your therapist prefer. At your appointment discuss with your therapist what you would like, or what problem areas you would like to focus on and then a suitable treatment can be decided to suit your needs.